When I lived in Oklahoma, I heard people say: “If you don’t like the weather here, wait a minute.” (Quote attributed to Mark Twain or Will Rogers). I found that West Texas is not immune to such whimsical weather conditions. When snow and ice prevent you from going to the campus, technology can prevent people from waking up in ditches. Record a video/audio lecture and post it in your course so that students can watch or listen to them by fireside. 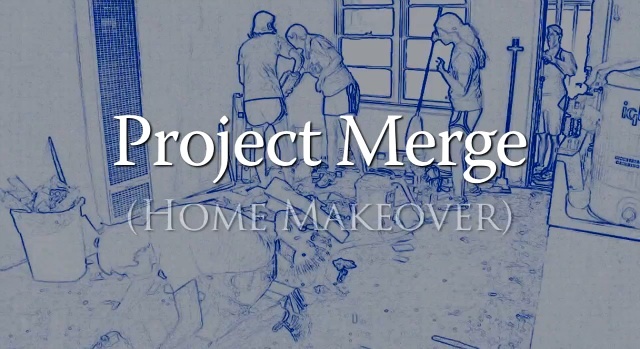 Got some other ideas, please share with us! The ACU Library’s Curriculum Builder LMS Plugin enables you to search for EBSCOHOST articles, e-books, and other digital sources directly from the Canvas system and provide access to your students. Here is how it works: You can search our ACU OneSearch directly from the Canvas LMS. Simply click the button “Add to Reading List” and your selections are saved for your students to view. Curriculum Builder allows you to annotate the reading list items so that you can provide additional information to your students. You can also share and copy other reading lists that have been created by faculty. So no more lengthy instructions or URLs for your students to follow to access the EBSCOHOST articles that they need. Watch this video to see how easy it is. Your students are giving presentations. You grade them over their content, their volume, their timing… and you have to have a sheet of paper to grade them with. You have to add up their grades, enter them in the grade book and then somehow share the grades with students. You then return the paper sheet to students for them to check where they can make improvements. Then you forget how you originally graded them unless you have made a copy of your grading sheet. All of these processes create busywork when you could be doing other things that add more value to student learning. It is easy now to grade student work with Canvas rubric without requiring them to submit anything digitally. As a matter of fact, you can grade almost any student work, including, but not limited to speeches, art work, sculptures, singing, dancing… with the rubric tool. And you can do that on an iPad as well. Create an assignment. Check tutorial here. 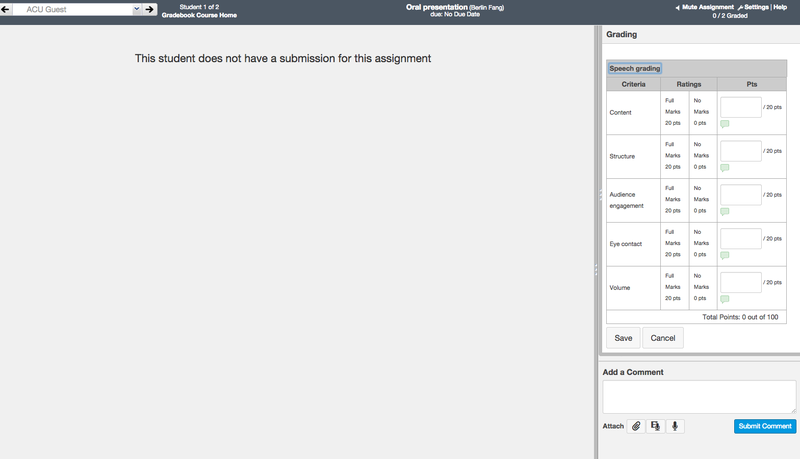 Choose “no submission” from the drop-down menu when you create an assignment. Add a rubric to this assignment. Check tutorial here. Open the assignment with Speedgrader on your computer or iPad. When you open this assignment, and see Speedgrader on the right, launch the Speedgrader. You will then see that there is no submission for the assignment. Just click on the button that says “View Rubric”. The rubric will then open, allowing you to grade with the rubrics, as shown below. Each of the steps above require a number of sub-steps which may vary slightly from assignment to assignment. We’d be happy to work alongside you if needed. A number of our professors use Turnitin to check originality of student papers. Turnitin helps to compare student work with its repository of student papers, as well as online sources. What if students have cited every source properly, but the sources they cited from are not good sources? Check the following video made by University of Mary Washington’s New Media Center about the CRAAP test (currency, relevance, authority, accuracy, and purpose) that can be applied to check the quality of online sources. If you use rubrics in your teaching, it is a good idea to develop a rubric to share this test, and apply the rubric to evaluate their bibliographies. University librarians should also be able to help students evaluate online sources. Laura Baker, ACU’s Digital Research and Scholarship Librarian provides this helpful page for evaluating online web sites. The library website also has many databases students will find useful. If you have some additional ways to teach students about quality online sources, please share in comments. The article brought up the concern that language and cultural barrier make it especially difficult for international students to keep up. Should professors then lower the bar to be “fair”? That is indeed a hard dilemma to deal with. However, lowering the bar will water down the education. It may frustrate domestic students without helping international students in the long term. It will make people feel bad if they find out you are lowering the standards for their sake. The trick is to be encouraging and supportive while keeping high expectations. It may not be a bad idea for a professor to work with an international student advisor to find ways to help international students, or to recommend remedial courses or tutoring for struggling students to catch up. There are many university resources available for students who are international, at risk, or both. Take advantage of such services. International students are not alike. It is easy to perceive them as a homogenous bloc while seeing “domestic students” as another bloc, but both groups display vast differences within themselves. Most Chinese students, for instance are comfortable with standardized tests but struggle with group projects. From an exit interview for graduating students conducted by ACU’s international office, a student from Egypt said she struggled with standardized tests. So it is important to acknowledge and address such differences. Getting to know such differences is often the first step. Most course evaluations are done at the end of the semester when it is already too late to make a change for that particular semester. It may help to conduct some formal or informal needs analysis at the beginning of a class, or conduct a mid-semester survey to recalibrate teaching. The article suggests that non-native speakers of English may not know some of the norms in an American classroom, such as “participating in classroom discussions, asking professors a question, engaging in group work.” Make sure that the such norms and “hidden rules” are brought to light. Reflecting and articulating such rules is a good teaching practice any way, since domestic students also may not understand them. As an international student I realized that sometimes professors assume too much of student understanding of the social or class norms. For instance, I handed in my first paper in America using MLA citation which is what I was taught in China as an English major, when my professor actually expected us to use APA, which had never been mentioned anywhere. I was caught by surprise. Left to their own choice, students may go to their own cultural groups. It is enriching, however, to break that up by assigning students to groups to make groups culturally diverse. In smaller groups, domestic students and international students may find it easier to open up and exchange ideas. The Inside Higher Ed article also recommends a great method to deal with domestic-international student confrontations due to backgrounds each bring into the groups. For instance, have students step into the shoes of “others” for empathy. I also found it inspiring from the article that one professor broke the Chinese and American ruts of thinking related to Tibet by introducing a third perspective: asking students to read views by Tibetans. I have heard again and again from professors that international students who are silent in class can better express their views online. Even if a course is entirely face-to-face, it may help to have some online space to 1) post documents that may be briefly mentioned in class; 2) provide an opportunity for international students to ask questions without holding back students who do not have the same questions; 3) provide a discussion forum for international students to express their views if they write better than they speak; and 4) allow international students to access certain content if more time is needed due to language barrier. Use a learning management system for such a space. These are a few of my thoughts. Do you have any observations or good practices for teaching in a multicultural classroom? Please consider sharing them with us! It has been seven years since Apple released the iPhone, and we seem to be observing something like a “seven-year itch” in our love for mobile learning. As smartphones become consumer products, mobile learning’s hype is wearing off — mostly in a good way — and we can now discuss the business of learning, instead of the coolness of devices and applications. This week, Educause Review published my article in which I discussed a concept called fluid learning that evolved from earlier discussions about mobile learning. “Fluid learning” refers to the flow of learning between mobile and non-mobile devices, such as a desktop computers. Fluid learning is enabled by a consideration of five attributes when designing content or instructional activities: neutrality, granularity, portability, interactivity, and ubiquity. The article also mentioned a number of practices at ACU. This may not be the best time to argue for educational testing given its bad press, given the many arguments against testing. For instance, testing could reduce education to the dog wagged by its tail. Test-driven educators may focus narrowly on preparing students to get good grades in high-stake tests, ignoring other significant realms of students’ minds and lives. However, if a test is done well, it really prepares students for learning. This week, I participated in the EduDebate of Wise Ed Review together with several other panelists, discussing various aspects of technology-enhanced standardized testing. Read more here. Please also consider reading the views presented by other panelists on the same issue. Adams Center for Teaching Excellence is committed to supporting faculty in developing more tests to be conducted online. There are many ways you can develop tests for use online, by manually creating it in a learning management system, by importing a publisher test, or by converting a test written in Word to be an online test. We would like to help you to get started. Turnitin is a web-based application you can use to check plagiarism, grade student work and facilitate peer review among students. It is used by an increasing number of ACU professors to manage class assignments. It works best for grading various types of paper assignments, though it can also be used to grade other types of student work such as presentations or recitals (See the Grade Anything page on the Turnitin website for more information) . You cannot administer quizzes or exams through Turnitin, but you can record scores from these types of assessments in the Turnitin grade book. It is now used as a standalone web-based application, not integrated with Banner or our learning management system. You can learn to use it by working with the Instructional Design team (David Christianson, christianson@acu.edu or Berlin Fang, bxf13b@acu.edu), attend a workshop (check Adams Center mail notifications of such events), consult a colleague who has used it before, or learn it from the Turnitin training page. Contact Berlin Fang (bxf13b@acu.edu) or David Christianson (christianson@acu.edu) to receive an Account ID and Join Password. You will need these to create a Turnitin profile. Fill out all the fields, using Account ID and Join Password that you received from Berlin or David. Please do not share such information with anyone, as the account administrator may change the join password from time to time for account security. Go to the Excel spreadsheet, edit it to have only three columns in this sequence, first name, last name, email. Get rid of the headings row (last name, first name, email), save the file. Once you click “yes, submit,” students will automatically receive an email invitation to create a Turnitin profile and join the class. If students have previously created a Turnitin profile, they will automatically be added to the class. Provide all the information you are asked for. Click also on “optional settings” to change the settings and save your changes for future use. Click on “submit” to complete. If you use CourseSites as the LMS for your coming semester, please be reminded that you will need to “invite” students to your course, and students will need to “confirm and register” to be able to get in to the course. In a way, this works like friend request in Facebook or connections request in Linkedin. 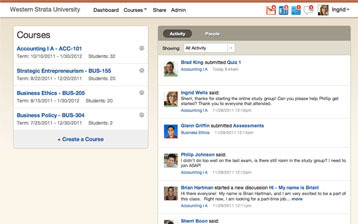 To invite students, go to the control panel of your course, find “users and groups” and then click on “users”. Click on “invite” to start your invitation. 1. Instead of typing all student email, copy all students’ email. To do so, go to MyACU, find your class, go to the class roster, and try sending email to “all” to launch an email window. Before sending any real mail out, just copy all the email from the “to” field. Open a blank Word document and paste these addresses. Use Word’s “replace all” function to replace “edu” with “edu,”, as CourseSites invitations require commas to separate email addresses. Then copy and paste it to the receivers’ field in CourseSites’ invitation email when you invite. 2. If a student encounters an error in accepting the invitation, ask him or her to clear cache. You might want to send link of this Wiki article: http://www.wikihow.com/Clear-Your-Browser’s-Cache to help the student learn how to clear cache. 3. If that still does not work, ask the student to switch to a different browser and try again. I asked CourseSites support which browsers work best, they said they would recommend Firefox. They found that the lower versions of Internet Explorers give more issues. Students may need to update to a higher version of IE before accepting such invitations, or use another browser for this purpose. 4. In some cases you may need to re-send the invitation if students find the link does not work. 5. You can send a second invitation only to those who have not accepted your invitation. To do this, go to “check invitation status” , and click on “invitation status” to sort students by those who have accepted and those who have not. This way all students who have not accepted the invitation will be listed together for easier selection. Check the boxes besides their emails and click on “send invitations” to resend your invitation. 7. Save your invitation drafts. 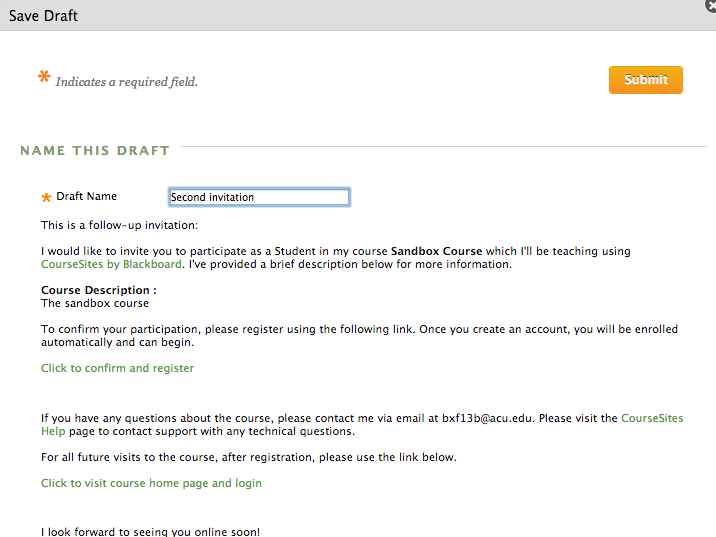 CourseSites has also added a feature to save your customized invitation message. Usually you get a default message. Feel free to use that if it suffices. However there are times you need to customize the message for various reasons. As you do so, please do not change the highlighted links. Also, consider saving each version of your invitation, which will save you much time. Do NOT copy such messages between courses as each course has a specific link. Overwriting such links by pasting the invitation message from another course may cause a lot of confusion and make it inefficient for you to manage your enrollment. Once you finish adapting your invitation message, save it under a name that you will recognize in the future. After you have saved your version of the invitation letter, you can choose a version of your invitation letter from the drop-down menu, as shown below, if you need to send another invitation letter. If you enjoy reading books using the Kindle device or the Kindle app on mobile devices, you will be happy to learn that you can convert any PDF or even Word file on your computer directly into a Kindle file using nothing but the good old email, so that you can read, highlight, annotate, as you could with a regular Kindle book. You will need to authorize an email to send from and find the email to send to. This can be done in the control panel of your Amazon account. Sign in to your Amazon account, navigate to “digital content” and click on “settings”, choose “manage your content and devices” under “digital management”, and then select “settings” again. On this page, find your Kindle email. You will notice that each device has its own unique Kindle email that has been automatically assigned. You can edit this email to something you can remember. For instance, I changed mine to berlinfangipadmini@kindle.com. After this, you can simply email your PDF files from your authorized email (in my case bxf13b@acu.edu) to your Kindle email (in my case berlinfangipadmini@kindle.com) . Make sure you use the word “convert” as your subject. After this email is sent, wait a few minutes and then check your Kindle app to find the document in your Kindle booklist. If it is not showing up, consider syncing your Kindle. Sometimes the format may not look very neat, depending on how you format your document originally. In most cases, however, I find it working well for personal reading. For more professional-looking eBooks, consider other applications such as iBook Author. RSS (Real Simple Syndication, as it is often explained) is a way to aggregate blogs or news you frequently read. You probably are already using it without knowing it. Many modules on your MyACU page are actually RSS feeds. ACU News, for instance, is an RSS feed. RSS feed is also a good way to keep updated with information key to your work. For instance, recently we have heard about the need to “push” updates about OpenClass to faculty. As a matter of fact, you could also proactively “pull” such information by using related RSS feeds. If you do not use Feedly and would prefer to receive feeds by email, try Shootthebreeze (Thanks to Dr. John Weaver for recommending this resource!) which will create email alerts for you for posts from your favorite blogs! You can also try the “subscribe2” tool of this blog. On the top right corner of this blog, you should be able to see “subscribe2”, under which you can type your email. This will also create email alerts for this blog. OpenClass also has a great feature to integrate RSS feeds in your class site. This would be very helpful to push blogs, sites of interest to the class you are teaching. This way, learning gets extended beyond the textbook and your classroom. Give it a try after watching this video. On October 25th, 2012, OpenClass will release an upgrade to the toolbar. The release of this upgrade will improve the overall navigation and experience of OpenClass. The OpenClass product design team has visually redesigned and rearranged the toolbar to include the following features: -The OpenClass course dropdown will only show current courses; all other courses will still be accessible from the Dashboard. -When Share is enabled (social feature), it will be accessible from the center dropdown underneath the list of current courses.-Once available for release, the OpenClass Exchange (digital textbooks feature) will be accessible from the center dropdown underneath the list of current courses. When it is released, the new social tools will also be available within the toolbar. -This will include in-browser notifications and modifications to the profile. The Adams Center will be hosting Pearson’s representatives for OpenClass on Wednesday, October 24th, for a special OpenClass Lunch and Learn session. They are ready for your questions, suggestions, observations, and experience about OpenClass. Please let us know if you would like to be a part of this special session by calling ext. 2455 or emailing your RSVP today! OpenClass app for iPad is here! The OpenClass app for iPad is here — check it out in the app store today! In addition to the app release, the Adams Center will be offering a special lunch & learn session on Wednesday, October 24th. 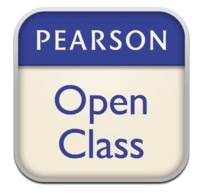 We will be hosting Pearson’s representatives for OpenClass who are ready for your questions, suggestions, observations, and experience about OpenClass. Please let us know if you will attend by emailing your RSVP today or by calling the Adams Center at extension 2455. In January, Apple launched an application for developing interactive content called iBooks Author. When the Learning Studio needed to produce an annual report at the end of our first year, we wanted to better understand how iBooks Author might change the way we think about textbooks and learning resources. We wanted to test its value as a tool for first-time users as well as advanced media producers. On Wednesday, October 10th, Nathan Driskell and Mat Bardwell will walk through opportunities and challenges in producing interactive content for the iPad using iBooks Author. Then, on Monday, October 15th, the Adams Center Instructional Design team with host iBooks Author for Beginners, to explore iBooks Author in a practical, hands-on session. Join us in the Adams Center to learn more about iBooks Author. RSVP today or call ext. 2455 to reserve your spot!